Carry the Gerber Ultralight L.S.T. Knife in your backpack or pocket when you head into the backcountry. The Ultralight L.S.T. 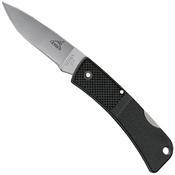 weighs less than an ounce and has a rugged reinforced-nylon handle. The handle, which Gerber designed more than 25 years ago, is what makes this knife so lightweight, yet it's extremely durable. This pocket knife folds closed, so it's easy to carry on you.